This is one of the most beneficial ways to make friends. Not only will you meet people who share a common interest with you, but you will meet people in your field! As a result, you’ll have plenty to talk about, while networking and helping each other with assignments at the same time. Greek life is a great way to meet friends. When you rush a Greek organization, you’re paired with people who have similar values as you. They also have tons of events other than parties, such as philanthropy work, bonding events, and study groups. 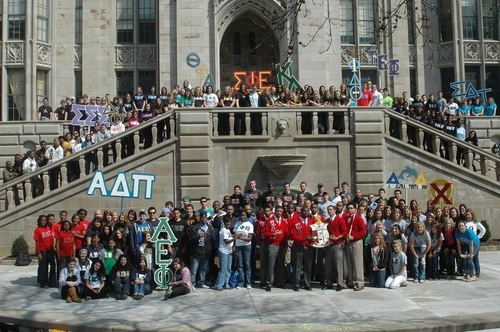 And if social Greek life isn’t your thing, join an academic or service Greek life organization! You’ll still find people who share your values, and you’ll still have tons of activities to do with them. A club sport is a great way to make friends because in a sport you have to work together and communicate. You don’t even have to be athletic or on a D1 team. Join an intramural team or start a pickup game with your floor mates or classmates who are probably just as skilled at sports as you are. If you identify with a certain race, sexual orientation, gender or identity, there’s probably a club for others just like you! You can meet people who are like you and perhaps have had some of the same experiences you have, and you can have a safe space to turn to if needed. Examples of these could be a women’s organization, a rainbow alliance/LGBTQ pride club, black action society, ect. 6. Your Her Campus chapter! Of course, who could forget your school’s Her Campus chapter? You’ll be surrounded by an amazing group of women who are friendly and unique. You don’t even have to like writing — you could join HC’s Public Relations or Social Media team. Also, HC hosts tons of events, like at HC Pitt, we have a late-night cookie sale, Her Campus Night Out, group dinners, fundraisers, you name it. You can easily find friends if you join any of these clubs, but most importantly, when joining any organization, you get out what you put in. Help out as much as you can. Go to multiple events and introduce yourself to people. No matter where you join, being involved is what makes the difference.